Where to Buy Zyrox Fly Bait, Zyrox Fly Granular Bait - 4 Lb - $54.95 for Sale with Fast Free Shipping! 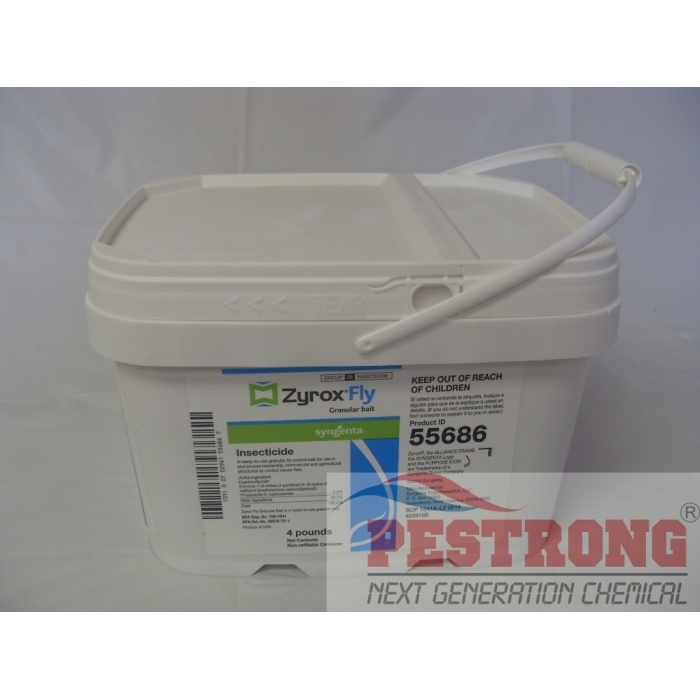 Zyrox Fly Granular Bait - 4 Lb contains the active ingredient cyantraniliprole in a granular bait formulation for use to control house flies. Maxforce Granular Fly Bait Insecticide - 5..
Ready-to-use granular bait contains 0.5% cyantraniliprole. Controls house flies in and around the outside of structures and protected or enclosed areas. Alternative house fly control chemistry for use in IPM and resistance management programs. Broadcast or scatter Zyrox Fly Granular Bait using suitable granular spreader equipment or directly from the container evenly to the target areas. Avoid placing the fly bait granules in piles and scatter as evenly as possible over surfaces. Apply 0.2 lb (3.2 oz) of Zyrox Fly Granular Bait per 1,000 sq ft when fly populations are low, and use 0.4 lb (6.4 oz) of bait per 1,000 sq ft when populations are high. Reapply bait every 7 days until fly population is at acceptable levels. Use commercially available bait stations that are designed to hold granular baits. Apply 0.2 lb (3.2 oz) of Zyrox Fly Granular Bait when fly populations are low using enough bait stations to make the necessary amount of fly bait available per 1,000 sq ft, and use 0.4 lb (6.4 oz) of bait in bait stations per 1,000 sq ft when populations are high. Replenish bait stations until the fly population is at acceptable levels in the target area. Do not use in food/feed areas of food/feed handling establishments unless placed in bait stations designed to hold granular baits. Bait stations must be used when using Zyrox Fly Granular Bait inside single or multi-unit residential structures, commercial establishments, food processing plants, restaurants and animal production facilities. You can purchase Starbar Fly Bait Station (sold separately).